Are you old enough to remember this? www.fractint.org and associated websites really breathe the atmosphere of the golden days of Fractint. Some of the sites still have “Made with Notepad” badges, do you remember those? Anyway, it’s really cool that Fractint is still under active development after all these years. Keep up the good work, guys! Encore: When going through my old images, I also found the example below. This is a file that I created with Fractint on 9 January 1991 (yes, I’m that old ☺). 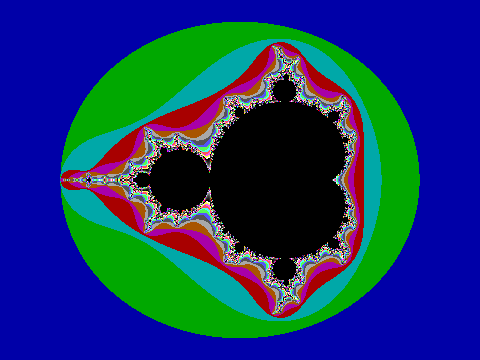 It shows a detail of the Mandelbrot set. Click on the image for the original (GIF) file. In my opinion, Fractint is STILL the best generator out there. I use it in a DOSBox emulation on Win7 simply because of its myriad of options. There may be quicker programs of this sort out there, but I don't know of any that can handle over 50 fractal types, or do parameter evolving, sound generation, 3D projection... this does them all out of the box. It may look dated nowadays, but in all honesty, it... just... works... as it is. You’re probably right. I didn’t really compare it with other software, but the possibilities of Fractint are still amazing. 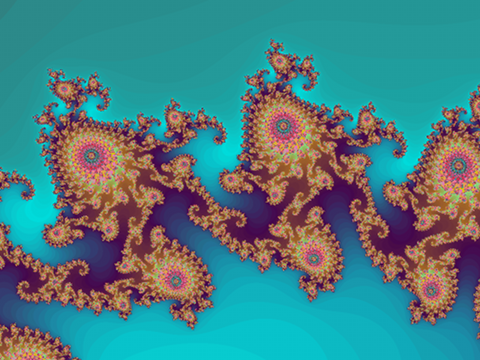 The Koch curve on Fractal Dimension is also done with Fractint, for example. I did use Mandel to create the black-and-white illustration where you can still see the filaments of the Mandelbrot Set; I didn’t manage to do that with Fractint.